Thank you Peter for you comment, very helpfu. 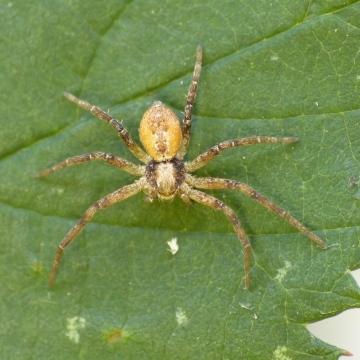 Philodromus in the aureolus group, which includes cespitum, can only be identified as adults under a microscope, and even then cause many arachnologists a lot of problems. At this time of year your's is a juvenile. From its overall appearance and occurrence on pines it might conceivably be Philodromus collinus, but this could not be determined without adults next year in late May/June/July. Hi, Can anyone help with this ID? I was searching for leaf mining lepidoptera yesterday on Scots Pine and came across this small Crab Spider. Dear Alistair, many thanks for the Segestria senoculata details. VC85, Hill of Beath, NT148901, 1/12/2014, Habitat: kitchen sink! The forum posts don't roll over, you just post and if the post is the first for a month it will replace the last post from the previous month as the one immediately visible. Thanks, I had already picked up and included the record from the photo posted from Bideford. It is shown on the maps. Apologies if this is a duplicate post, tried to post earlier but the forum entry page doesn't seem to have rolled into December 2014 yet. A WAB member has posted this..
Hopefully that's enough for a record.